If we had come here to simply slow down, this would be a good start. The Land Rover is only going about 10 miles an hour, bouncing on tank-like cat tracks up a snowy road. Towering firs draped in snow line the way and occasionally open to reveal 50-mile views into Washington State’s powdery Cascade Range. Snow slides off the boughs, the tiny flakes so cold and dry they sparkle and float against the crisp sky. It looks like that carefree opening scene to every winter wilderness movie—you know, just before things go horribly wrong. Fortunately for us, the easygoing air persists throughout our trip. Packed inside the Rover and rapidly steaming up its windows are two families: mine and my brother-in-law’s. We’re embarking on a three-day visit to Alpine Lakes High Camp, a cluster of nine A-frame cabins and one small lodge tucked into the trees at 5,000 feet, about 100 miles east of Seattle. Established in 1978, High Camp is bare-bones enough to feel like 1878: Water is spring-fed, and cabins have neither running water nor electricity—only woodstoves for heat and outhouses for bathrooms. Activities are decidedly offline and sporty, including snowshoeing and backcountry skiing. Kids’ entertainment is even mellower, with puzzles and endless material for snowballs. The forced slow pace is perfect for the first vacation my wife and I are taking with our nearly 1-year-old daughter. We’re hoping to slip out for some solo downhill runs while keeping our kid nestled in the lodge; the weekend forecast calls for subfreezing temperatures and more snow, conditions great for avid skiers but not for a small child hours from the nearest pediatrician. Christine and I fell in love in wild places. Our courtship involved more mountain peaks than peaked napkins. We climbed Mt. Rainier, backpacked through Kenya, and spent a month sea-kayaking around British Columbia’s coastal islands. During another kayak trip, I hid an engagement ring in a dry bag for three days and proposed on an empty rock islet. When we had a child, some people told us that it would put an end to our bold travels, and others said parenthood would be the biggest adventure of all. It’s true that raising Ada is an exhilarating kaleidoscope of hope, doubt, fear, wonder, and love. But our favorite tiny human probably shouldn’t be stashed in a sea kayak or towed up an alpine summit. We know we have to tone down the extreme travel, but by what degree? High Camp takes shape through the Land Rover’s foggy windows. There’s no antler-emblazoned gate or landscaped welcome meadow. One second we’re driving through forest, and the next we’ve stopped amid a handful of angular, earth-toned cabins poking out of the white powder like gnomes failing at hide-and-seek. Sam, our 6-year-old nephew, leaps out of the car as if shot from a cannon, followed by his more subdued 2-year-old sister, Lucy. The looks on their faces match what we’re feeling: wide-eyed wonder. 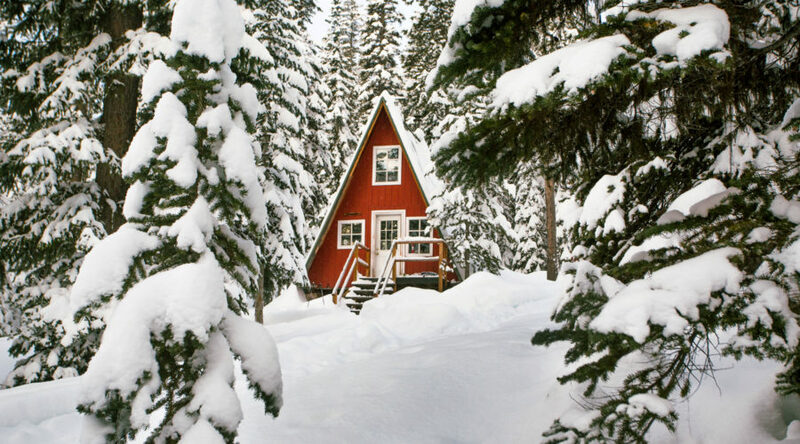 The snow is piled high, up to Lucy’s chest, everywhere but on the slick, narrow trails connecting the cabins. It’s a bit like walking down a greased bowling lane with snow bumpers—except that here, if you venture off-trail without skis or snowshoes, you sink knee-deep. Natural consequences quickly teach Lucy and Sam to slow down. Katlynne, High Camp’s 26-year-old mountain host, greets us with a smile. Hoisting our gear, we follow her to our one-room cabin, Bluebell. The air inside is warm thanks to Katlynne, who stoked the woodstove hours earlier. She demonstrates how to light the lantern and cook stove, points out the pots and pans and the five-gallon water bucket, which we can refill in the lodge sink. It’s at once elemental and exotic. onto the mattress with our girl between us. We organize our snow pants, parkas, headlamps, towels, and baby clothes on the cabin’s nails and shelves. Bluebell feels like a big sailboat berth—without the gentle swaying and with icicles the length of ski poles hanging outside the windows. The place couldn’t differ more from our home in Hood River, Oregon, with its digital thermostats and insulated blinds. There’s just enough time before darkness falls for everyone to burn off some energy. Sam and Lucy and their parents, Kate and Brett (Christine’s brother), emerge from their neighboring cabin, and we take turns sledding down a curving lugelike chute. With each whooping run, our nerves settle from the long ride to get here. We’re easing into mountain time, a simple place where decisions are informed by energy levels, appetites, and daylight. The lodge begins to glow against the blue dusk as we head inside for hot drinks. Colorful maps and a few rows of bookshelves, one made from vintage skis, brighten the walls. A woodstove the size of a washing machine quietly hums, logs popping in its orange interior. The kids quickly convert one of the dining tables into an art station of colored pencils and paper, and the adults take over another table with the cheese, crackers, warm red wine, and cold beers we packed in. The Starks were pioneers in the region before it even had a name, much less federal protection and a multi-year waitlist for campsite reservations. Then, as now, the timber industry coveted the forested acres of the central Cascades. Echoing recent debates over national monument designation in Utah and elsewhere, the battle to protect this area went all the way to the White House, where President Gerald Ford, at the behest of Washington Governor Dan Evans and locals like the Starks, agreed to christen almost 400,000 acres as the Alpine Lakes Wilderness. The Starks were allowed to build on 20 acres just outside the wilderness boundary, situating their cabin near ample spring water. More shelters followed, as well as new owners, a wood-fired hot tub, and sauna, making the camp a beginner-friendly wilderness experience with recreational access. And fantastic drinks too: Back in the lodge, Christine hauls a three-foot icicle inside and cuts it into blocks with a serrated pocketknife. Justin tosses a chunk into each Dark & Stormy. Suddenly, we snap out of adult time to see Lucy climbing the narrow spiral stairs to the lodge’s loft. Brett returns her to the floor to help feed Ada, whose curious fingers move over every surface, seeking detritus to cram into her mouth. We’re reminded that High Camp isn’t childproofed; there are built-in ladders, bunk beds, fires, and slippery stairs to watch out for. But it’s so cozy that even Sam, normally a ball of energy, is content to curl up on the couch and sip cocoa. We remain comfortably vigilant. Eventually, we return to Brett and Kate’s cabin for a quick, kid-friendly dinner of chicken quesadillas heated in a skillet. As Christine takes Ada to bed, I head to the lodge to check out trail maps and plan tomorrow’s ski tour. In just one year of parenting, we’ve learned the importance of traveling in packs in order to spread child-care duties around. Brett and Kate are pros, and they’ve offered to watch Ada for two hours. After all, this trip is about us, with Ada in tow. I like to think we’re imparting some sense of adventure, but she’s not even 1. She won’t remember a thing. The sound of skis swooshing on snow wakes us from a light morning sleep. A couple from another cabin is returning from a dawn tour with Katlynne, who doubles as a guide. Trails marked in blue diamonds lead out from High Camp, accessing thousands of acres of ridges, bowls, glades, and alpine lakes. Ada’s waking up, too, arms overhead, fists pumped in prone victory pose. She has always been a good sleeper and has spent a few nights with us in tents, so this isn’t her first rodeo. Despite the cabin temperature fluctuating between arctic and sub-Saharan, she slept fine. Probably better than Christine or me. We unload her from double sleep sacks, change her diaper, and angle her into a thick pink fleece onesie that makes her look like a cotton candy starfish. We mitten her hands and load her into the backpack carrier for a quick snowshoe up the groomed road. In a quarter mile, the hallway of trees ends in a clear-cut. The gauzy morning sun illuminates acres of pillowy snow mounds, winter’s polite disguise for tree stumps. It’s at once pretty and disconcerting. High Camp’s west side abuts protected national forest that leads, in turn, to the Alpine Lakes Wilderness, but Weyerhaeuser owns logging lands on the other three sides. Our walk ends atop a ridge with a view west, up the forested, cloud-shrouded Roaring Creek valley. It’s the first time we can see High Camp’s geographical position at the tip of the terrain. It’s a stark reminder of why people fight for it. Back at camp, Christine and I hand off Ada, don our ski kits, and head out on the existing trail, ducking under branches dripping in pale green Methuselah’s beard. We pass the sign for Inspiration Point and catch more vistas across half of Washington. In less than an hour we’re on an open ridge, where mellow ski pitches descend toward the lodge. Only the three tracks from earlier skiers carve into the shallow powder. Christine realizes that at nearby Stevens Pass, one of the state’s top ski resorts, crowds of people are probably stuck in lift lines. “We’ve got this all to ourselves!” she yells before heading down, letting out her standard “Yee-oww!” as she picks up speed. The final pitch to the camp weaves through the firs of Wild Bill Hill and straight to our cabin. I ski up to Christine for a high-five that turns into a hug, as if to say, “We’ve still got it.” We’re learning that time is compressed when you’re a parent. Our outing lasted less than two hours, but being out in the wilderness on our own terms will stay with us for a while. After lunch, Brett and I sled with Lucy and Sam while Kate and Christine snowshoe with Ada in tow. When we return, Katlynne is stirring the waters of the wooden hot tub with a long paddle, like the Good Witch of Winter over her cauldron. She gives us a thumbs-up, and we grown-ups switch out soaking before launching into the happy hour–dinner-bedtime routine. That’s the thing about uncomplicated places like this. Having few to-dos feels surprisingly liberating, and you can slip into a comfortable pattern almost immediately. The experience will likely be lost on Ada, but for Christine and me, this brief venture into the unknown reminds us that the world is still big and available. Two renovated 1960s A-frame cabins and an A-frame house on the Tofino Inlet are the perfect stage for games and hot drinks in between brief walks on the moody winter coast. From $107 U.S.; theshorelinetofino.com. This historic national park lodge offers a few dozen clapboard cabins with breathtaking views on the notoriously wild Olympic Coast, an hour’s drive from the Hoh Rain Forest. Bonus: The lodge’s rustic dining room serves to-die-for dishes. From $99; thekalalochlodge.com. and north of Bass Lake, cabin rentals, vintage trailers, a tipi tent, and three modernized midcentury A-frame cabins offer a quiet retreat. From $260; farmeadow.com. Imagine if the Swiss Family Robinson moved inland and offered rooms to tourists. The whimsical but sturdy treehouses, spiraling staircases, and suspension bridges near the Siskiyou National Forest are an overnight playground for kids and adults. From $105; treehouses.com.